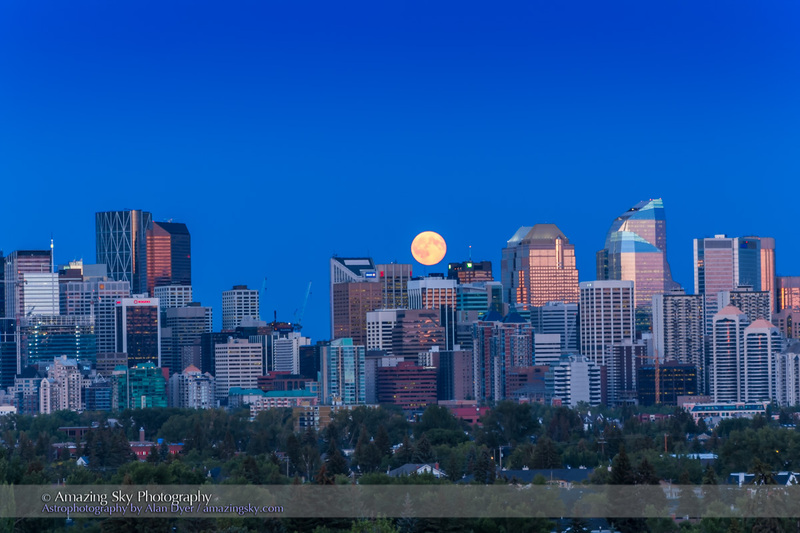 The much-publicized “Blue Moon” of July rises over the skyline of Calgary. Last night, July 31, many people looked east to see a wonderful moonrise. Did it look different than any other moonrise? No. But did it look great? You bet. I set up my cameras at a site in northwest Calgary, picked for its sightline looking east-southeast over the downtown core of Calgary and directly toward the moonrise point. 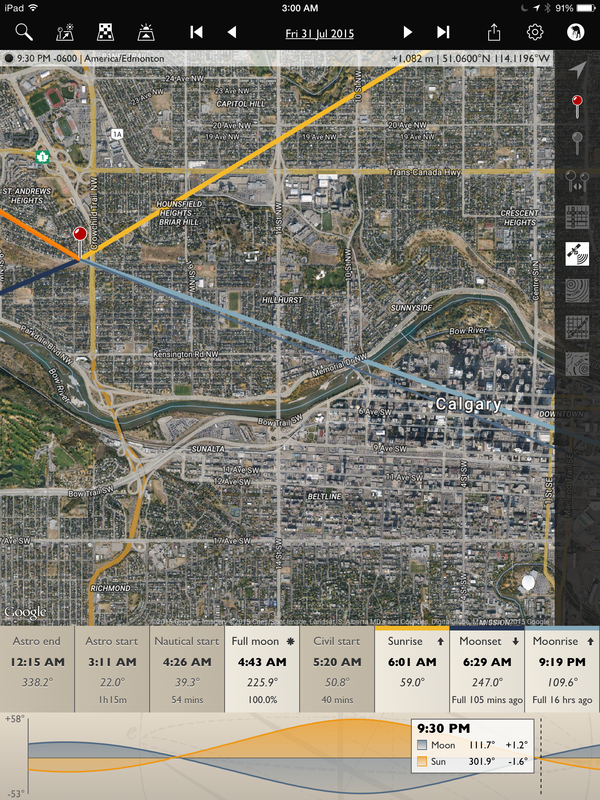 I used the software The Photographer’s Ephemeris to plan the location and angles. 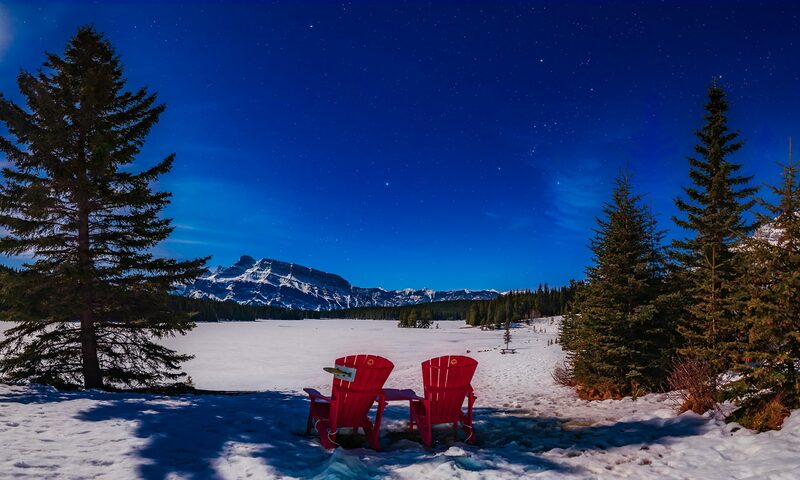 It is wonderful for making sure you are in the right place at the right time for catching a photogenic moonset or moonset. Here’s the screen shot from TPE that showed me where to be Friday evening. The blue line aims to the moonrise point. Of course, despite the planning the Moon did not look blue! Blue Moons, as they have come to be defined, never do. The term now means the second Full Moon in a calendar month. We had a Full Moon on Canada Day, July 1, and then enjoyed a second July Full Moon one lunar cycle later on July 31. I shot the scene with two cameras, each shooting hundreds of frames for time-lapses, from which I extracted still images. A short 1-minute music video of the result is here at Vimeo. Enlarge the screen and be sure HD is selected. As a technical note, for the processing I used the latest version 4.2 of LRTimelapse and its new “Visual Deflicker” workflow which very nicely smooths out all the frame-to-frame flickering that can plague daytime and twilight shots taken under Auto Exposure. While the shutter speed does constantly decrease, it does so in 1/3rd-f/stop steps, yielding stair-step jumps in brightness. LRT smooths all that out, with v4.2 doing a much better job than earlier versions.